The next fabulous blogger in my guest post series is Deborah from Mommy Crusader and Her Knights and Ladies. 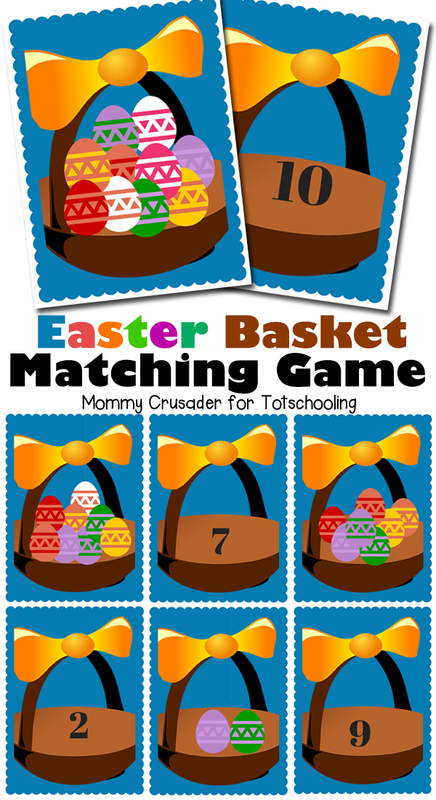 She is mommy to five young children, and blogs about kid's activities, crafts, parenting and even creates free printables like the one she is sharing today! 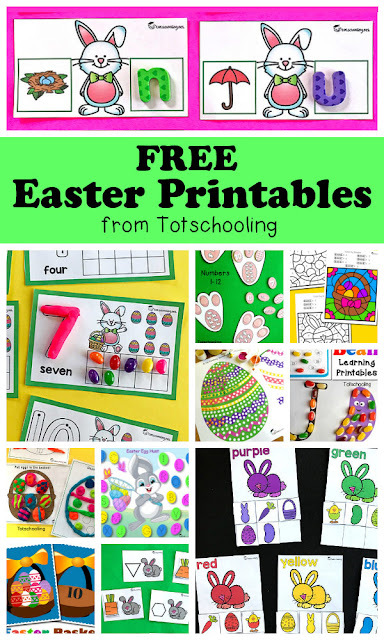 You can find a lot of great ideas for preschool educational activities, such as C is for Counting, D is for Dots and E is for Equals, all of which include free printables, so definitely check them out! I’m so excited to be guest posting for Totschooling today. Educating my little ones is something I take rather seriously, and Totschooling is a great blog that gathers fabulous resources for parents who work on educating their toddlers and preschoolers. Today, I am sharing a Math activity geared for three to five year olds. We had a lot of fun with it, and I hope you do too. Who doesn’t love to go Easter egg hunting? 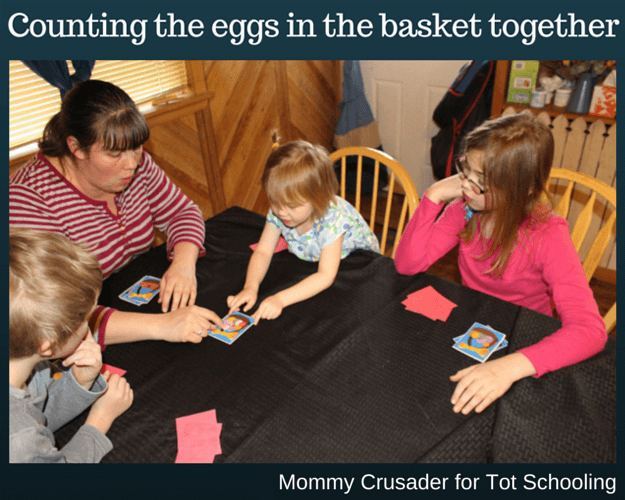 I know my children love to, so I thought I’d make a Math card game based on an Easter egg hunt. The game is based on the classic card game war, but with a slight twist. Shuffle the cards and deal them all out. The youngest player goes first. Everyone turns over their top card and the player examines the cards to see if there is a match. If there is a match, that player keeps the match and has another turn. Any cards that aren't part of a match are discarded. Continue until there is a round with no matches. Move to the next player. They play the same as the first player, with everyone turning over their top card and the player examining them to see if there is a match. This player keeps all matches and discards any non-matching cards. This player keeps playing until there is a round with no matches. 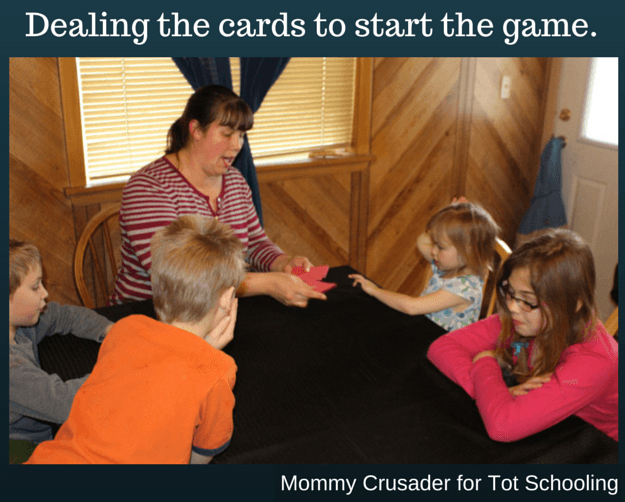 When any player runs out of cards, shuffle the discard pile and re-deal the cards to the players. Continue the game until every card has been matched. This game is really helpful for little ones who are working on one-to-one correlation and also very helpful for number recognition. They also really like it because they can win. 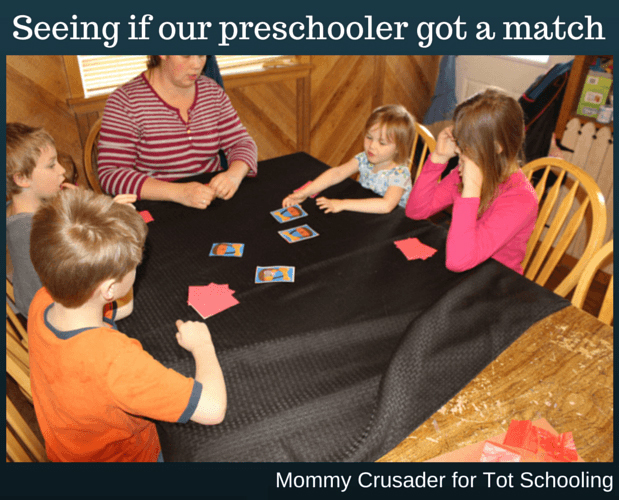 My preschooler considers the game a 'win' whenever she gets a match. Deborah is the Mommy behind Mommy Crusader and Her Knights and Ladies. The name of her website was chosen because her children are always playing princess and knight, and sometimes being a mommy feels like a crusade. She has five children, 10 and under, and one awesome and supportive husband. 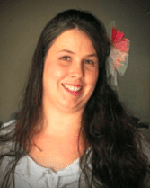 With her bachelor’s degree in Interpersonal Communication, she writes about parenting tips and fun kid’s activities and crafts with a focus on preschool learning activities. Check her out at MommyCrusader.com.